Apple’s Home Server: A Mini-Review of the Time Capsule 500GB. | The Small Wave. Apple’s Home Server: A Mini-Review of the Time Capsule 500GB. I call this a mini-review not due to length, but because I’m documenting my experiences with the TC in implementing it at home. I did not set it up in multiple ways, or perform extensive benchmarking, etc. I bought it to create a new wireless network in my home, and I’m reviewing it based on my experience in doing just that. What I want from the Time Capsule. Create a new wireless “n” network to replace my “g” network. Aside from the speed bump, the new network would use WAP2 security instead of the older WEP. Use it as a router for my broadband connection (cable modem) and share that connection between two Macs and two iPhones. Use it to share my HP 5850 printer. The printer is a wireless device, but my intent was to share it via Ethernet. And, of course, wirelessly backup both machines via Time Machine to the TC’s internal hard drive. My old router (a Linksys “g” unit that has performed flawlessly for three years), will be retired. Plugged cable modem into WAN port. Plugged HP printer into Ethernet port. Plugged TC into wall outlet. I watched it boot up and the light go green, then launched the AirPort Utility (APU). It found the Airport fine and I initially used the option to create a new wireless network and just stepped through the prompts (use WPA2, set passwords, name the TC and the TC’s disk, specify DHCP for my Internet, etc.). It rebooted and both Macs see each other, but there was no Internet. So I chose Manual Setup and manually added the DNS servers from my ISP, but that made no difference. Then it occurred to me that I likely just needed to recycle the cable modem. I did so and, voila!, I have Internet. For printer sharing I had some concerns because the doc always discusses sharing USB printers, not about sharing printers via Ethernet. It can, but you have to enable it. In Manual Settings mode click the Printers icon and then select the option to share printers over Ethernet WAN port all you have to do is plug it in. It was that simple. Both Macs already had the driver for the printer and found it just as easily over Ethernet as WiFi. Finally, I verified that the TC’s drive was visible to both Macs by opening up Time Machine and seeing it there. However, I didn’t crank up a TM backup right away for reasons I’ll get to presently. At this point I had established a new, faster, more secure wireless network, have my Macs and iPhones sharing the Internet connect, am sharing a printer via Ethernet, and have access to the wireless hard drive. Not bad for 40 minutes. An issue, and the first Time Machine backups. I’m thrilled, but then I open up the MacBook and, upon waking from sleep, there’s no Internet. The iMac and TC drive are visible, so it’s connected, but the Internet connection is not re-established. My first inclination was to compare the settings for the TC to those from the Linksys I’d printed before-hand. 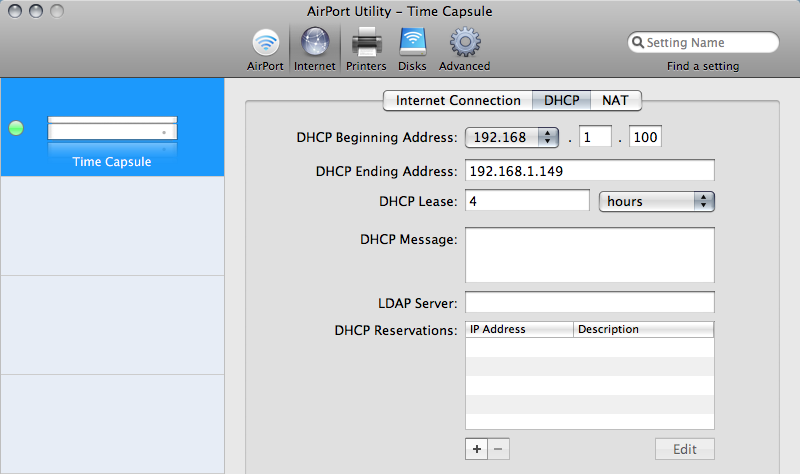 Only real difference I saw was that the internal DHCP addresses on the Linksys were 192.168, whereas the TC used 10.0. Seemed pretty shaky to me, but I changed it to 192.168 (see below), let the TC reboot, and the issue went away. In the two days since then the MacBook (and iMac) have slept and woken up many many times and the Internet connection always resumes within 10 seconds. I don’t know why the internal IPs would make a difference, unless the older 192.168’s were cached somewhere. To be honest, for all I know simply rebooting the TC at that point even without the IP change might have fixed the issue, but I’ll never know now. OK, on to backups. Following the advice I’d read in several places, I wanted to do the first TM backups via Ethernet instead of wireless. I plugged the MacBook into the TC and started a backup. It was going slowly, and I concluded it was using the AirPort even though Ethernet was available. I killed the backup, turned Airport OFF, then started it again. Much better. Backed up 42GB in under 2.5 hours. Then I turned AirPort back on, unplugged Ethernet, did a Backup Now from TM’s menu and it worked fine. I followed the same process for my iMac; it backed up 162GB in less than eight hours. Since then I get hourly backups on the iMac just as I had been doing with an external USB drive. The MacBook, however, is not quite working like that, as we’ll see. As I frequently opened and closed APU and “played” with settings, one thing I noticed is that if you so much as breathe on them the TC needs to reboot. It’s just a bit of an annoyance. I know after a few days you never mess with the settings again (when I printed out my old router’s setting I realized I hadn’t even looked at them in years), so I probably shouldn’t mention this, but it’s my blog, so there. Twice during the first few hours of using the TC, when it rebooted it came up fine but the APU didn’t see it. It kept spinning even though the device was up and lit green. In both cases I force quit APU and then it was fine. Since those two examples I’ve used the APU many more times (with reboot) with no issues. At this early date I have only one bona-fide bug to report. After it sleeps, the MacBook wakes up and can access everything, yet TM does not resume backups. If I select Backup Now from the menu it does so, and then backs up every hour as long as the machine stays awake. But once it goes to sleep TM needs to be “kick started” again. Also, if I fast switch to another user on this machine the same thing occurs. I suspect this is actually a TM bug, and not related to the TC. My iMac does not experience the issue. It seems TM doesn’t fully “wake up” along with everything else on the MacBook. Right now I’m quite pleased with the TC. Setup was easy, it’s working as designed, and I’m now backing up my MacBook regularly. Further, I’ve been able to get rid of the crappy external USB drive I had on my iMac for backups. Today I read a nice article from PC Mag about wireless peripherals for use with a MacBook Air. One of their recommendations is to use the Linksys “n” router ($250) and a Maxtor 500GB drive ($200) for a great wireless network with wireless backups. That’s $450. The 500GB Time Capsule is $299, and takes up less space and one less power outlet. Seems pretty obvious to me which makes the most sense. Obviously, with only two days’ experience with this thing I’m going to want to get a couple weeks under my belt to be completely confident in it. Frankly, the Linksys is a hard act to follow in terms of reliability, so if the TC drops connections, etc, then I’m going to have big problems with it. But in two days, so far so good. If the thing gives me any grief, I’ll be sure to post it here. [UPDATE 5/10/08:] It’s been over two months since I wrote the above, and I’m just as happy with the TC as I was when I first got it. The single bug I reported (MacBook not resuming backups upon wakening) went away with the 5.3.1 update to Airport Utility — and subsequent firmware upgrade to the TC. Backupsnow typically resume within 15 minutes of waking the MacBook. I have not had a single instance of the network connection failing. Further, while I did lose my Internet connection once, the TC light was green and I needed to re-cycle the cable modem to address it. Therefore the issue seemed unrelated to the TC. All in all I couldn’t be happier with this device. This entry was posted in General and tagged Apple, Hardware, Time Capsule by Tom Reestman. Bookmark the permalink. Yes, the iPhone is 802.11g, so when it’s on the network transmitting data the network must “throttle down” to “g” speeds. However, the iPhones (I have two in my house) are not on the network very often. Most of an iPhone’s life is spent in standby, at which point it isn’t on the network at all. Great review. Looking forward to getting a Time Capsule. Good catch on the PC mag article, too. Imagine, an Apple solution cheaper than third-party! I’d plug the Mac in that same Ethernet port to ensure the port is working. Assuming the port is OK, if the printer also supports USB I’d try sharing it that way just to see if it works. If there was a routine to perform for the printer with the old router maybe it needs to be performed again. At this point it’s hard to say whether this is a printer or TC issue. In my case, the printer had never been on Ethernet before, being used wirelessly with my Linksys. As a ‘b’ device, however, I opted to use Ethernet with the Time Capsule. I just plugged it in and it worked. I can’t get my ethernet printer to work with Time Capsule. It is connected to Time Capsule through an ethernet port but is not recognized. This configuration worked fine through a Linksys wireless router with ethernet ports. Any suggestions? The last update fixed the Wii wireless connection problem. It’s only been a few days since the review, but so far all is well. I changed the setting to blink the light at network activity, and found it was always “active” (and blinking) so changed it back to glow constantly. Those two reboots are all I’ve done in the last four days. No dropped connections or any other issues so far. It does seem that with the Linksys the MacBook was back on the Internet pretty much “instantly” upon waking, whereas with the TC it takes 5-10 seconds. That’s the closest thing I have to a complaint with the unit right now — and I’m fine with it. The software is sensitive. It seems like merely opening up the Airport Utility forces a restart. One thing I’ve discovered with my AE: sometimes when things go awry, it’s not enough to unplug/plug the AE. A few times, I’ve had to do the same with my switches on the network. The 2nd strange issue is my Wii no longer connects wirelessly to the AE since the upgrade to Leopard. Not that I’ve spent much time trying to troubleshoot it, but interesting nonetheless. Thanks. I will turn off the WAN setting for the printer and see if it makes any difference. When I went to Printers, it didn’t show any USB printers shared, and the setting for sharing Ethernet printers was unchecked, so I checked it. Regarding TM, my tests were all with the MacBook plugged in, I know it will not run when on battery. Further, I know it runs every hour, and I was would wait even more than an hour and verify that it does not start. I still they think there’s a bug there. Well, I turned off the WAN port setting and the printer is still shared. The tipoff should have been that it says WAN, not LAN. Not sure how I missed that because there’s the same WAN setting for shared disks, and I specifically avoided that because I didn’t want my drive available from the Internet. I think I had USB printing on the brain (still not sure why Apple only touts USB print sharing) and just checked it without thinking. Thanks for pointing it out, Chris! You are misinterpreting the meaning of the “share printers over Ethernet WAN port” checkbox. That box allows you to access a USB printer that is attached to the base-station from the Internet (the WAN port) as well as from the local network (the LAN ports). If you have an ethernet printer all you need to do is connect it’s ethernet cable to the Time Capsule so the printer is on the network. The printer shares itself, Time Capsule has nothing to do with sharing it.